One of the sharrows a driver sees on Ellsworth Street downtown after crossing the bridge. They indeed want bicyclists to take the middle of the travel lane, where those “sharrows” have been painted. Ron Irish, the city street and traffic expert, told me the sharrows on the downtown couplet of Highway 20 had long been advocated by Albany’s Bicycle and Pedestrian Commission and are included in the city’s transportation systems plan. 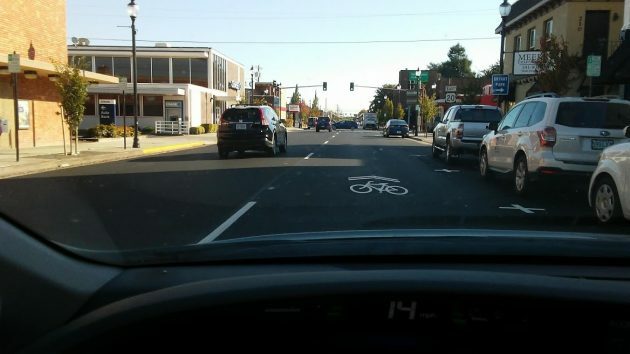 Now that ODOT has finished resurfacing the two streets, it is adding the sharrows. 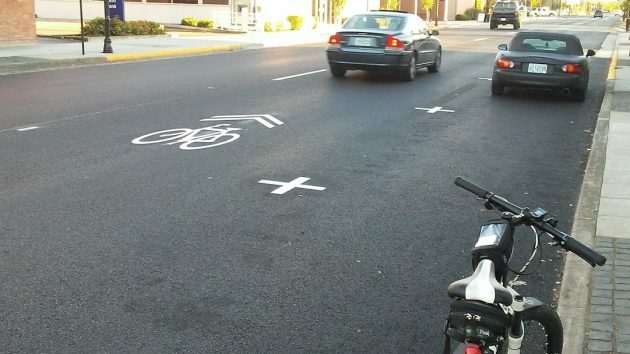 As of Monday, the painted symbols were in place on about half of Ellsworth. On the bike, I’ve tried to avoid Ellsworth and Lyon because of the traffic and parked cars. Now, encouraged by the sharrows, I might try riding in the middle of the lane just to see how that works out. Contemplating a sharrow on Ellsworth from the safety of the sidewalk. So, essentially, the City and State are trying to create increased tension and traffic problems between autos and bicycles by putting these things on two of the worst traffic come points in Albany. Brilliant. You meant “choke points” perhaps? Sorry, but I have been taking the center lane for years. I do not slow dow traffic. Don’t believe me? Come follow me. No ebike needed. I dont care wherw they put the “sharrows” in the road. To put a bicyclist in the middle of the road and call it safe cause of white paint on a roadway is complete stupidity. With all the distraction drivers put themselves through thats not the smartest place to put us. Again i feel like its a failed attempt to quiet the bicyclist and continue providing for the people behind the wheel of a 3k lbs. death machine. Hasso – on a different topic. Would you check out the south end of Ellsworth and tell me if ODOT changed how the left two turn lanes – that turn east to go under the overpass – originate? It used to be that the left lane divided into 2 turn lanes. Now it appears that the right lane splits with cars having the option to turn left or go straight. That would be a smart change — no more struggling to get in the left lane to make the turn. Thanks for the comment and calling my attention to this change. Your comment prompted Tuesday’s story on this. Dang, road tax from those bikes really paid off. Now the entire road is fair game. Just a continuation of the state travel plan from Kate’s minions. Choke points, engineered congestion, and utter chaos. Bikes are cars except when they want to be pedestrians. It’s all a big push to put a bike under us all. What’s next a toll booth at the top of each bridge? Out here in rural Linn county, that is, out side of the metropolises of Albany, Lebanon. Sweet Home and Harrisburg, the speed limit on our roads is 55 mph and “bike lanes” are nearly nonexistent. We are able to co-exist with neighbors, commuters, semis pulling 51 ft. trailers with livestock and seed and doubles with straw, tractors and farm equipment (including our own) that practically cover the road and bicycles. We respect that the road is to be shared with as much good humor as is possible. Why then, at 25 mph can’t folks have the patience to share the streets of Albany with bicycles ? So do or should bike cyclist obey all vehicle laws on using road ways, be required to have insurance same as my Chevy???? ?